3 full days with Thomas Ingmire, 3 lunches, 2 dinners, breaks and handout material. Overnight accommodations are available for $75 per night (twin bed and private bath) include breakfast. HURRY only 4 spots remaining in this workshop! If you cannot make this weekday workshop, Thomas Ingmire is teaching the weekend prior to this workshop in Waco, TX – March 18 & 19th. Contact Jeanne Dittmann for details. You are invited to a free lecture Making Poetry Visual where Thomas explores the affinities between calligraphy, poetry, and music in a discussion of his collaborative work with contemporary poets. This work originated in 2004 when he met the English poet, David Annwn. The poetry collaborations continue to this day and include poets from the UK, the Philippines, Singapore, Tibet, and the USA. 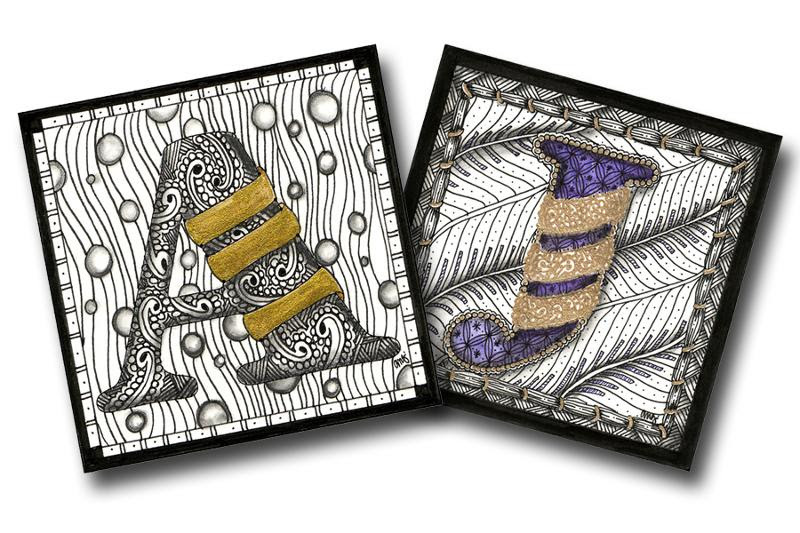 Students will learn decorative patterning techniques to create a monogram letter suitable for framing using pigment ink pens, gold gouache and watercolor. Supplies: $10 cash due to instructor. Contact instructor with your preferred monogram letter or one will be randomly assigned. Please REGISTER early due to limited seating. If you have any questions about this class, please contact Angie Vangalis, instructor. Unleash the creative artist in you as we explore mixed media and design an abstract aqueous media painting on watercolor paper. 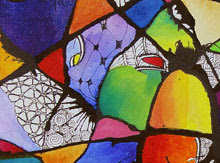 Students will be using acrylic paint, patterning and watercolor painting techniques to create this little masterpiece. Supplies: $10 cash due to instructor for project materials. With over 30 years of experience, Antonio has become one of the world’s top calligraphers. He learned how to make his own quills, taught himself how to make ink and paper, and has since mastered the art of calligraphy.His clients range from the Crown Office to Tiffany & Co. and Kate Moss. Paul will be offering workshops and lectures throughout Austin and Dallas/Fort Worth, Texas during mid May 2017. Learn how to letter with metal nibs, gouache, and a myriad of tools along with design elements and principles to design your next calligraphic piece. $15 Supply fee due to instructor for project materials – Parallel Pen, Pen holder, metal nibs, palette, gouache, assorted papers, hand outs and teacher supplied materials for class use. Spend a 3-Day retreat weekend of fun and learning tricks of the trade with a day session of Envelope Artand two days of Brush Calligraphy with Carol DuBosch – PLUS extra lettering activities after dinner. Learn to write a personal script using a pointed brush and discover the many new uses for this exciting calligraphic style on a 37 acre Bed & Breakfast ranch in Aurora, TX. Just north of the Texas Motor Speedway. You must be a member of the Fort Worth Calligraphers Guild to attend this retreat. Please visit www.FortWorthCalligraphersguild.com for details. 6 seats remaining.